Game of Thrones is an unequivocally amazing series. Season Seven, even though it is only seven episodes, does not disappoint fans. The entire season continues to enthrall and captivate the audience. This season gets the same rating, 5/5, but I wish I could award more. Season Seven means only seven episodes of the highly acclaimed and much-anticipated Game of Thrones and with only one more season announced, Season Seven is one to revel in and absorb every single detail because as the catchphrase of this protolithic series has changed, so has changed the Game for the Iron Throne. "Winter is here" and the audience should get their warm clothes on because it's going to be a cold one. As mentioned in the review of Season Six, Game of Thrones costs $10 million dollars per episode to film. Still, in my opinion, it is one of the most electrifying, intense, and suspenseful, fantasy dramas ever made so every minute of the hour episode is worth every penny spent. The cast is amazing, the scenery and settings real, and the clothing spectacularly fitting. There is no detail left to chance and it clearly shows how much effort goes into Game of Thrones. Seasons 1-6 is based on the book series A Song of Fire and Ice by George R.R. Martin, however there are actually only 5 books written. Like the prior season, this current season is written by several different writers. The story of the fight for the Iron Throne remains consistent with Martin's book series and the prior seasons. The writing is beyond exemplary- the dialogue and storytelling are captivating and the audience will hang on every word. In fact, the mystery written into Season Seven surrounding the question "Who is Jon Snow?" is so well written that even when the information is researched, revealed and provided to the audience through the script, it is still shocking. The consequences of actions between Jon Snow (Kit Harrington; Seventh Son) and Daeneyrs Targaryen (Emilia Clark; You Before Me) throughout the season play such an important part of the conclusion, that one can tell there was much thought from the very beginning as to just exactly how this season was going to end. One of the best features of the Game of Thrones storylines is that the writers do not miss a step. As the prior seasons did, Season Seven begins as Season Six ends. There is no lag in the storyline, no missing time in the sequences- the story flows as Jon Snow organizes the defense of the North and is recognized as King of the North. As Daeneyrs arrives home with her Unsullied Army, Jon must make a decision to go to her and request her help and leave his people or to fight the White Walkers alone. His true leadership comes through as he leaves his people under the leadership of his sister, Lady Sansa (Sophie Turner; X-Men: Apocalypse) and makes the journey South to beg Daeneyrs' assistance. In the meantime, Cersei (Lena Hedley; The Purge) is trying to hold onto her crown with her brother Jaime Lannister (Nikolaj Coster-Waldau; Black Hawk Down) at her side. Tyrian Lannister (Peter Dinklage;X-Men: Days of Future Past), Bran Stark (Isaac Hempstead Wright; The Boxtrolls), and Arya Stark (Maudie Williams; Doctor Who) make their way to their respective homes, bringing both answers and questions, as well as conflict to their families. Facing battle, negotiations, and love, Season Seven has all the aspects of a great season. Constant movement in the story never keeps for a dull moment, yet the writing flows, allowing the audience to easily follow the storyline. The conclusion of Season Seven is an anticipated conclusion, but one that is no less a jaw-dropping moment. The Blu-ray is presented in HD with 1080p resolution and aspect ratio of 1.78.1. The picture is crisp and clear. The special effects, such as the dragons in battle, are amazing and in death – breathtakingly beautiful. The drawings on the cave wall found by Jon Snow and Daeneyrs are clear without any blurriness present. As in prior seasons, the setting is either colorful or bleak and dreary, as it should be, so in that respect, the colors are brilliantly contrasted without being overdone. The contrast between the whiteness of snow beyond the wall and the actual wall itself sets the scene and you can almost feel the cold emanating from the screen. Audio is presented in the melodic 5.1 Dolby Atmos and TrueHD 7.1. Again, consistent with prior seasons, there is not one thing amiss with the sound quality. All dialogue is clear and the background music is even and enhances rather than distracts from the storyline. I normally don't mention packaging but the whole presentation of Season Seven, from the actual writing to the scenery to the actors up and including the Blu-ray packaging is impressive. The Blu-ray set contains 3 discs but the actual packaging must be mentioned. It is a fold out into four sections and the inside Blu-ray holders are a scene from the battle beyond the wall. 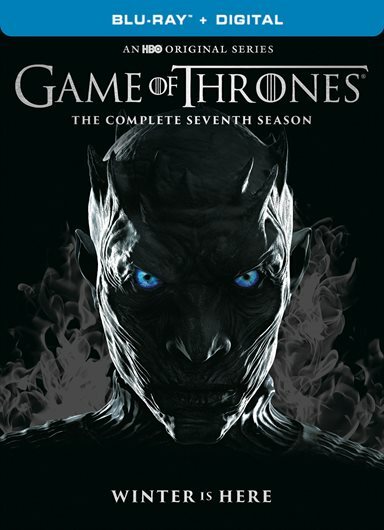 The outside covers feature black and blue-tinged half faces of four main characters, with their eyes blue like the White Walkers. Fold the case back up and it slides into a black outside box that says "Winter is Here" on the back side with a picture of the Night King on the front, again with those crisp and piercing blue eyes. This all sits inside a clear cover with the title on one side and what appears to be snow on the other side. Special features on the Blu-ray include commentaries presented after each episode, so there is no having to switch discs to watch the bonus features. You watch the episode and then watch and listen to the corresponding commentaries by the actors, directors, writers, special effects crew, and more. I am so impressed as to how Game of Thrones switches up the presenters of the commentaries- you don't have to listen to the same person explaining and providing their opinions about everything- this gives the audience a chance to hear what everyone has to say. In addition, while there are only seven episodes, the studio has provided the audience with eleven commentaries. Besides each episode commentary, additional bonus features are provided, such as an In-episode Guide (providing information on characters, settings, and histories); Histories and Lore (learn about the mythology of Westeros and Essos); From Imagination to Reality: Inside the Art Department (two-part featurette); and Fire & Steel: Creating the Invasion of Westeros (behind-the-scenes featurette with cast and crew interviews). In addition, this version comes with an additional Blu-ray: Game of Thrones Conquest and Rebellion. Provided in its own case, this Blu-ray is an animated history of the Seven Kingdoms. Only available with pre-orders, the bonus Blu-ray contains 45 minutes of what could be rightfully called a prequel to the Game of Thrones, as it gives a history of all the Houses and ends just before Season One begins. Jon Snow is King of the North- at least in the beginning of Season Seven. Will the North still be there for him when he returns or will Sansa Stark take his place? Will Cersai continue on her path to self-destruction as she has been the entire series and when will we see her fall? Will Daeneyrs finally get what she wants in Season Eight or will such a secret that has been discovered, be revealed to thwart her plans? Winter is here and with only one season left, this past season has brought a culmination to the storyline and plot that cannot be missed. Game of Thrones is an unequivocally amazing series. Season Seven, even though it is only seven episodes, does not disappoint fans. The entire season continues to enthrall and captivate the audience. As my recommendation for last season, this season gets the same rating, 5/5, but I wish I could award more. Download Game of Thrones: The Complete Seventh Season from the iTunes Store in Digial HD. For more information about Game of Thrones visit the FlickDirect Movie Database.